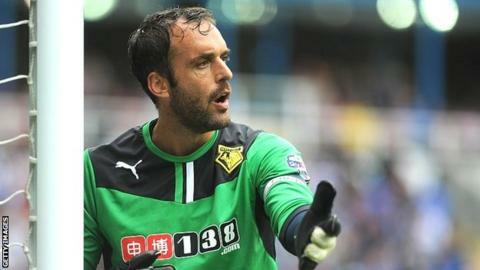 Manuel Almunia's error gifted Bolton a third straight win as Watford suffered their third consecutive home defeat. The decisive moment came on 27 minutes when Almunia dropped a Neil Danns cross beneath his legs and Jermaine Beckford converted from close range. Hornets goalkeeper Almunia failed to reappear for the second half. Watford had chances to level but Bolton also threatened and Danns was denied by a sharp save from substitute Hornets keeper Jonathan Bond. Dougie Freedman's side rise to 15th in the Championship table, while Watford drop to 10th. Both sides created early openings but it was Bolton who made the breakthrough thanks to Almunia's mistake. Any danger seemed to have been dealt with when the Spaniard bent down to gather a low Danns cross from the right. But, having got the ball within his grasp, the former Arsenal keeper let it squirm loose through his legs and Beckford gleefully capitalised. Watford worked hard to recover, George Thorne shooting over before Nyron Nosworthy hit an acrobatic half-volley narrowly off target and Fernando Forestieri curled an effort wide. Almunia was replaced in goal by Bond, who made his England Under-21 debut in midweek, and Hornets boss Gianfranco Zola introduced Diego Fabbrini soon after as he switched to a more attacking formation. Bolton keeper Andy Lonergan saved well from Forestieri before Chung-Yong Lee missed the target at the other end with a lob when clean through. And the visitors came close to doubling their lead when Danns capitalised on a slip from Daniel Pudil, but Bond was equal to his left-footed shot. Danns had another opportunity with two minutes remaining but his strike from the right-hand side of the area was deflected over. "It's been a long week after picking up a lot of injuries and to concede a goal like that was tough. "We didn't create enough and Bolton are a good side that are in good form. "There was too much of just passing the ball around when they had everyone behind the ball. "We have to be better and get the ball wide more but it was tough today." "You go along through a season hoping to pick up two or three of the little opportunistic goals where it drops for you and Jermaine Beckford is the master at that - that's why I brought him to the club and he's won us the game. "The two goalkeepers dropped the ball but I felt we had a player that was on form and he smacked it in the net. "But, apart from that, I felt we controlled the game out of possession in the second half and controlled the way they played and I felt we deserved to win because of that." Match ends, Watford 0, Bolton Wanderers 1. Second Half ends, Watford 0, Bolton Wanderers 1. Substitution, Bolton Wanderers. Robert Hall replaces Neil Danns. Attempt missed. Daniel Pudil (Watford) left footed shot from outside the box misses to the left. Assisted by Joshua McEachran. Corner, Bolton Wanderers. Conceded by Marco Cassetti. Corner, Bolton Wanderers. Conceded by Joel Ekstrand. Attempt missed. Daniel Pudil (Watford) header from the centre of the box is just a bit too high. Assisted by George Thorne following a set piece situation. Diego Fabbrini (Watford) wins a free kick in the attacking half. Corner, Bolton Wanderers. Conceded by Daniel Pudil. Attempt blocked. Neil Danns (Bolton Wanderers) right footed shot from the right side of the box is blocked. Assisted by David Ngog. Delay in match George Thorne (Watford) because of an injury. Delay in match Neil Danns (Bolton Wanderers) because of an injury. Foul by George Thorne (Watford). Substitution, Bolton Wanderers. David Ngog replaces Jermaine Beckford. Offside, Bolton Wanderers. André Moritz tries a through ball, but Jermaine Beckford is caught offside. Offside, Bolton Wanderers. Kevin McNaughton tries a through ball, but Neil Danns is caught offside. Attempt missed. Fernando Forestieri (Watford) right footed shot from outside the box is high and wide to the right. Assisted by Diego Fabbrini. Substitution, Watford. Bernard Mensah replaces Javier Acuña. Attempt saved. Neil Danns (Bolton Wanderers) left footed shot from the centre of the box is saved in the bottom right corner. Assisted by André Moritz. Foul by Diego Fabbrini (Watford). Attempt blocked. Cristian Battocchio (Watford) right footed shot from outside the box is blocked. Corner, Watford. Conceded by Alex Baptiste. Attempt blocked. Diego Fabbrini (Watford) right footed shot from outside the box is blocked. Assisted by Marco Davide Faraoni.